This is the story of Neil and Yvonne Armitage, a couple of New Zealanders in their sixties who, in May and June 2009 broke from their own conventions to experience a six week sailing adventure in Greece. The dream became a reality. This is the fifth part of the logbook that describes this adventure. Click on the thumbnails to see a larger 800x600 photo in a new window. Vonitsa was a wonderful town that so typified one of the great things about sailing in Greece, the towns. It was unpretentious, the people were friendly, it wasn’t small and it wasn’t large, it had a castle, it had a town quay, it had fishing boats, it had a small harbour for visiting boats, it didn’t rely on tourist traffic, it had an agricultural background, it was nice. Tomorrow, the 18th, we would head back to Lefkas. Today for the first time in 6 weeks we would go nowhere. It was wonderful, sleeping in, cleaning, packing, doing some laundry, topping up the water tank, washing down “Spyros”, going for a walk up to the Venetian fort, walking around the water front to the causeway and Islet of Koukouvitsa, shopping, checking the internet, finding a taverna for this evening. 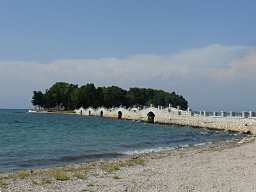 The Islet of Koukouvitsa, Vonitsa. June the 19th our last sailing day. We made a slow start this morning I released the lazy line about 10am while Yvonne motored “Spyros” out into the gulf where a tempting light northeasterly was puffing away. We had a few hours just to sail for the sake of sailing as we had planned to make the 4:00pm opening of the bridge to the Lefkas channel. Yvonne soon had “Spyros” up to 4-5 knots on a starboard reach until it was time to bear away to avoiding the shallows in the north of the Gulf of Amvrakikos. We ran towards the western end of the gulf until the breeze died then we had to start motoring. A large pod of feeding dolphins and flocks of sea birds paid little attention to us as we motored out of the gulf passed Preveza to pick up the channel markers that would guide us out of the gulf and into the Ionian Sea. Gulf of Amvrakikos, Yvonne soon had “Spyros” up to 4-5 knots. On any other day the breeze in the Ionian Sea would have still been quite light at 2:00pm and we could have had a pleasant sail getting to the Lefkas channel and filling in time until the 4:00pm bridge opening. 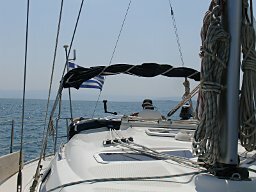 Today, when we arrived at the outer buoys of the Preveza channel the breeze was from the west at 12 rising to 16 knots. “Spyros” took off close hauled on a heading that would make the Lefkas channel on the nose. We reined her in with a couple of rolls in the genoa when the breeze got to 16 knots but she still romped along at 6-7 knots; we reached the Lefkas channel entrance in 50 minutes and made the 3:00pm bridge opening. Nikos got a text message to say our ETA will now be an hour earlier. 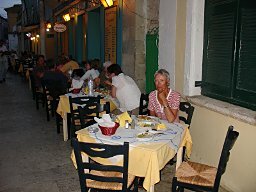 Lefkas, we returned to our nice taverna of 2 weeks ago. Back at Lefkas the adventure was all over. Nikos refuelled, checked and cleared “Spyros”; we lowered our flag, started packing and later returned to our nice taverna of 2 weeks ago. Back in New Zealand the winter has been cold and wet, a stark contrast to the warm sunny days aboard “Spyros” in the North and South Ionian Seas. Our suntans may be fading but the adventure is far from a distant memory; the Greek Waters Pilot is already open at Chapter IX, The Dodecanese.